Last month I began to cook my way through the upcoming Modernist Cuisine cookbook by using their PDF excerpt they made available for download. Out of the three recipe examples given, only two have enough information to make them in their entirety. First I created their recipe for instant hollandaise. Next up: their selection of recipes for smooth purees. Out of the five fruits and vegetables listed, three are prepared sous vide. I decided to do those first, because any chance to use my vacuum sealer makes it worthwhile for it to take up a huge chunk of my counter space. The saute recipes will be covered in Part II. We feel the parametric recipe is a strong concept for an instructional cookbook. Such a recipe does more than merely suggest methods for making one dish the same way again and again— it reveals the pattern and reasoning behind the chosen ingredients and methods, and thus makes it clearer how to apply those lessons in other circumstances. The parametric recipe thus takes the master recipe to a more detailed level, and serves as a launching point that allows you to change ingredients and quantities in a number of ways to produce dozens of variations. That’s right up my alley – taking these new techniques and understanding the fundamental idea behind them, so they can be applied to whatever I’m cooking. I love this book already, and it’s only a PDF file. Well, wouldn’t you know it. Artichokes are out of season around here at the moment (the peak season is August through October). But we have a variety of different grocers; there must be someone who has some. Sure enough, Whole Foods had some packaged baby artichokes available. Is one package enough? I eyeballed it and thought it looked OK to me. The process was simple enough: get the hearts out and thinly slice them, vacuum seal them with vegetable stock and olive oil, and drop them in a sous vide bath. The scaling directions are so great. You set the veggie to 100%, and add the other ingredients in the correct proportion, no matter how big or small the quantity. In my case, these baby artichokes didn’t give up much in the way of meat, but I dutifully went ahead and prepared them. After sitting in the water bath for 45 minutes, I put them in the blender, and promptly had my first puree fail. Does This Look Smooth To You? Yeah, Me Either. Turns out that you really need more than a few baby artichokes to create the volume necessary for the blender to blend well. I’m just a guy cooking at home and this recipe is aimed at culinary professionals who need to crank out 400 covers a night. The recipe just doesn’t account for single servings. Fair enough. I’ll have to wait until they’re back in season and try it again. It was a decent enough spread and I ate it within a few bites. Undaunted, I moved ahead to the next one on the list (and conveniently needing the same temperature water bath). 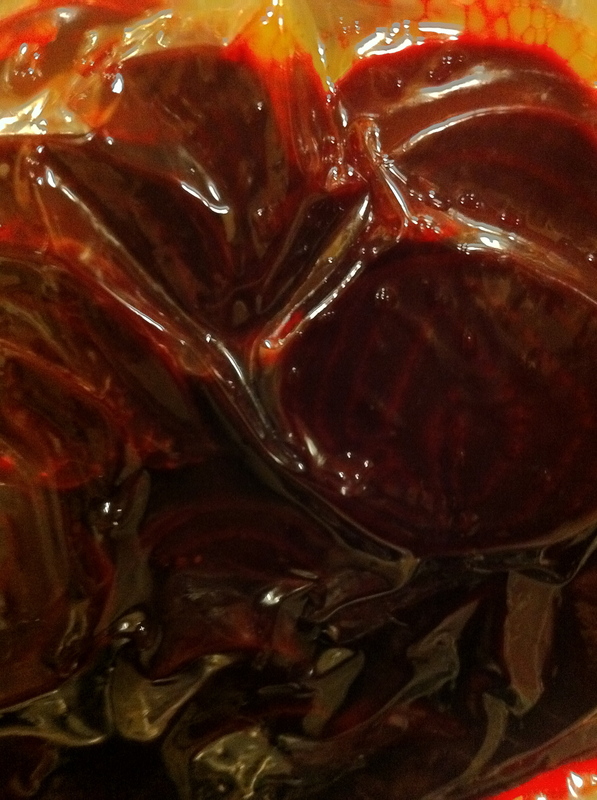 Once again, the first part of the directions was simple enough: peel and thinly slice some beets. 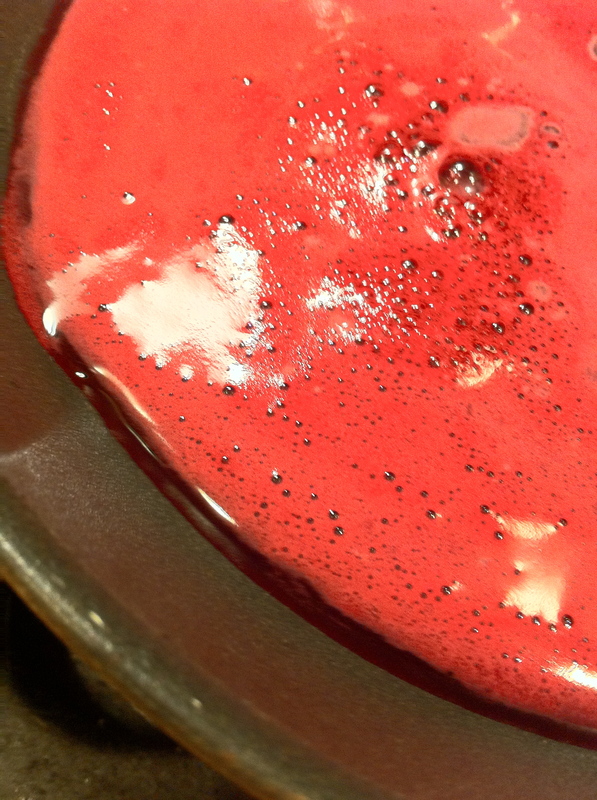 The next ingredient was interesting: cooked beet juice. 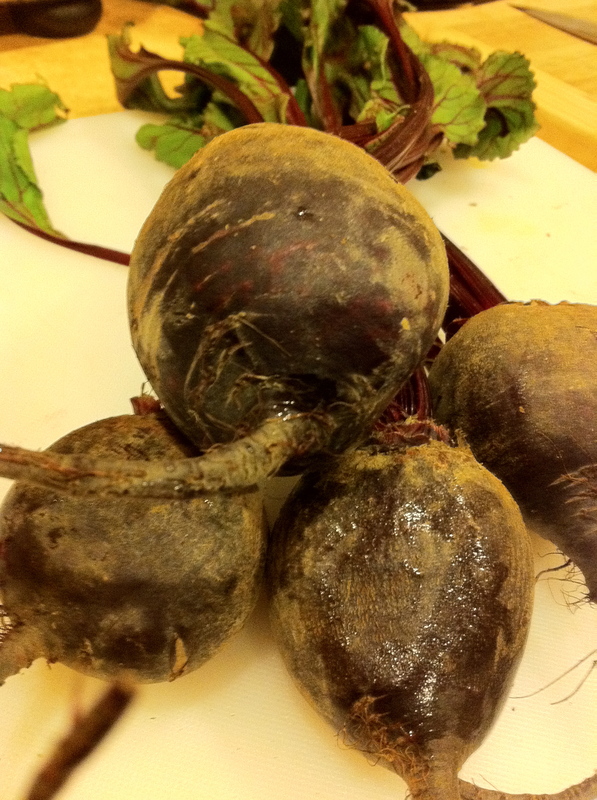 Why cooked beet juice? As the book isn’t published yet, I don’t know. Well, OK then. I juiced a beet and cooked the juice. All this fuschia foam developed and floated on the juice. Should I discard it? Probably. So I skimmed the top, added the juice to the beets with butter (all carefully measured with a digital scale of course) and sealed it up. After an hour in the sous vide bath, I pulled it out and put it in the blender, where unlike the artichokes, it did its magic well. 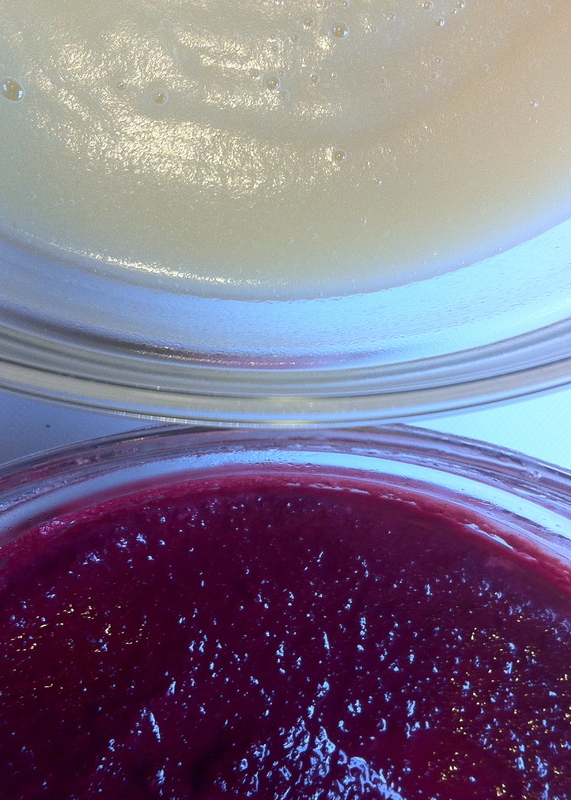 I had my first puree of sous vide beets. It definitely had that earthy beet flavor, and an intense bright color , but the texture was a bit…oh, grainy? Maybe sandy is a better word. Somehow I was expecting a texture like pudding – perfectly smooth. Is this the correct texture? Perhaps when the recipe calls for a commercial blender, they mean a Vitamix or Blendtec mixer. Most likely it’s meant as a base for something else, and not meant to be eaten alone. 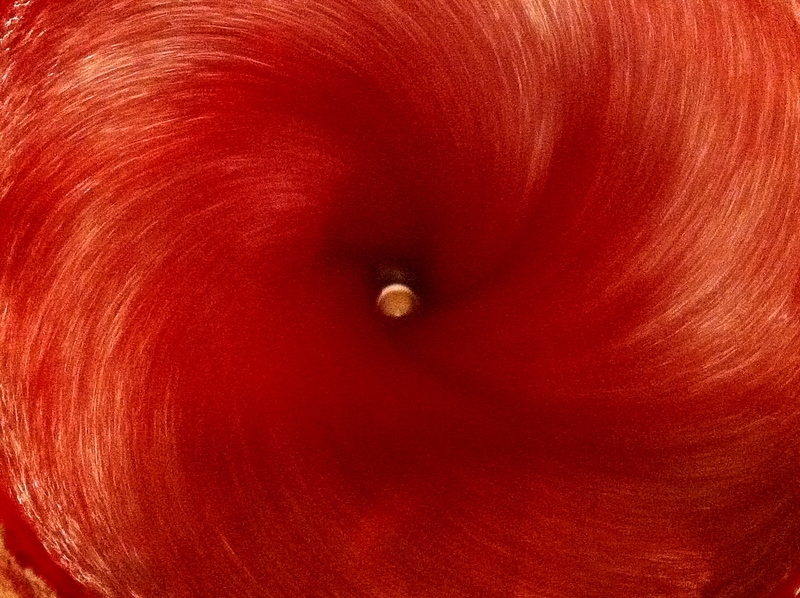 I don’t know for certain, but certainly, it isn’t bad at all – just not what I was expecting. As a matter of fact, I see a borscht in my near future. 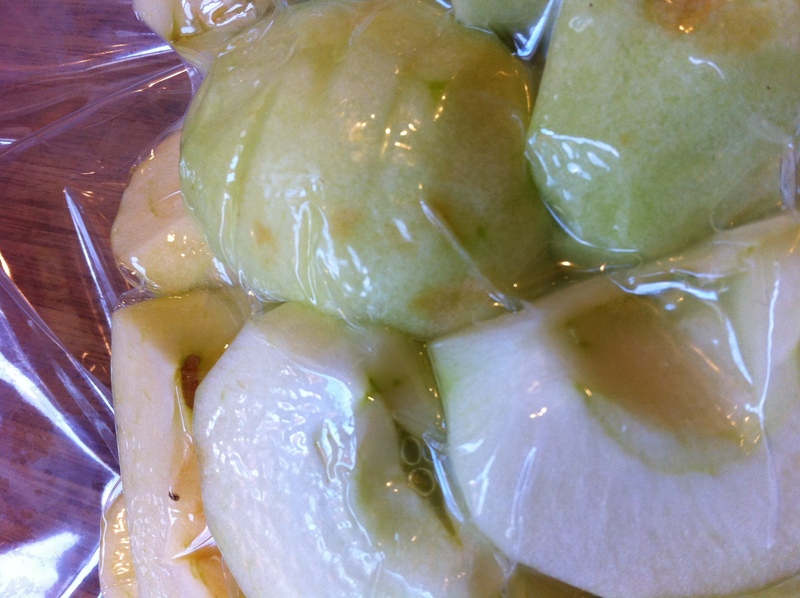 So the final recipe that called for sous vide was the apples. These required no other ingredients. Just slow cooked apples. I like the simplicity. I chose a mix of Red Delicious and Granny Smith apples. 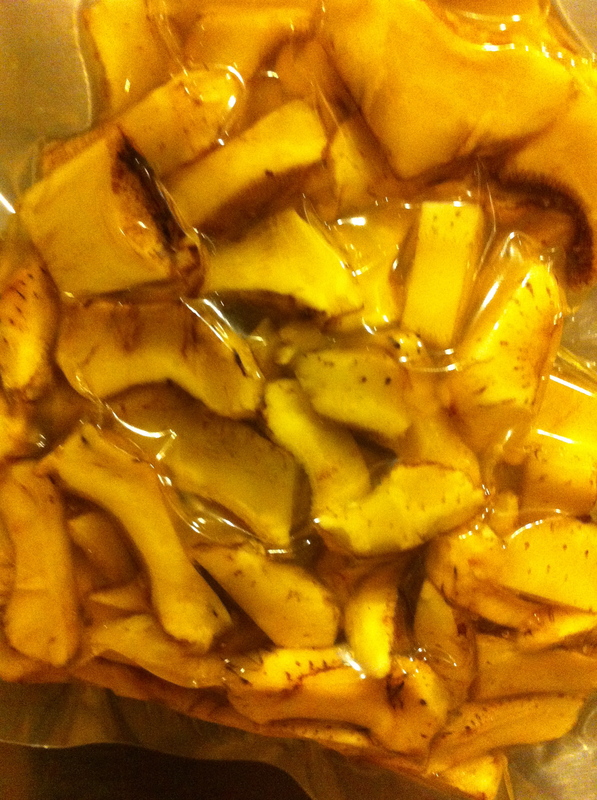 Peeled and quartered, I sealed them up and put them in. After they were done I blended them together and…wow. 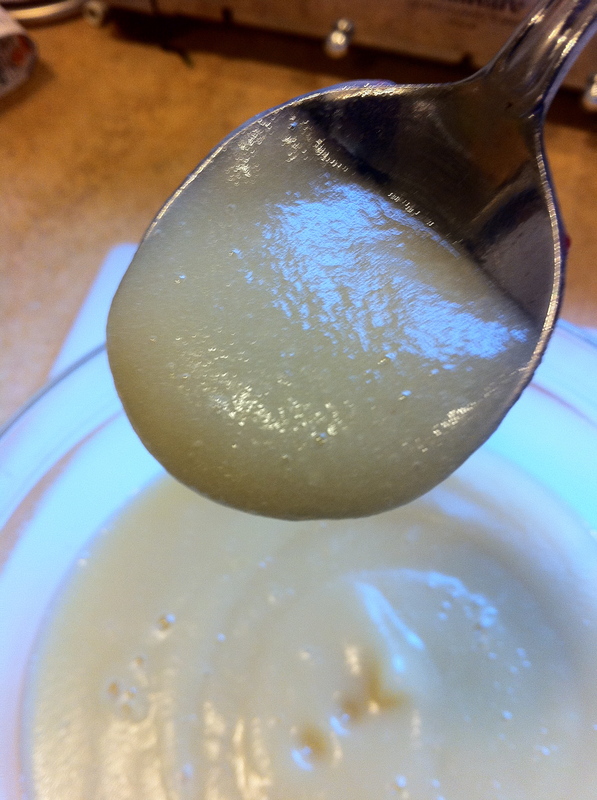 Sous vide apple sauce. So smooth, so creamy. Just ridiculously good. This Tastes So Good. Whoa. It’s funny how the texture improved with each progressive recipe. I felt like Goldilocks – “Ahhh, this porridge is just right!” And now, because of the parametric recipe, I know how to apply it to other fruit and vegetables like pears and carrots as well. I am loving this cookbook that isn’t published yet. Awesome. The Modernist Cuisine team is quite amused that you are actually cooking from the examples in the PDF we posted! That wasn’t the intent – those are just supposed to describe how the recipes work. But the recipes are real so of course it can be done. The printing plant in China is working way, and in just a couple months you’ll have a LOT more to work with! We have about 1600 recipes in the book, but if you include the variations described in marginal notes it is much over that – probably 2000. 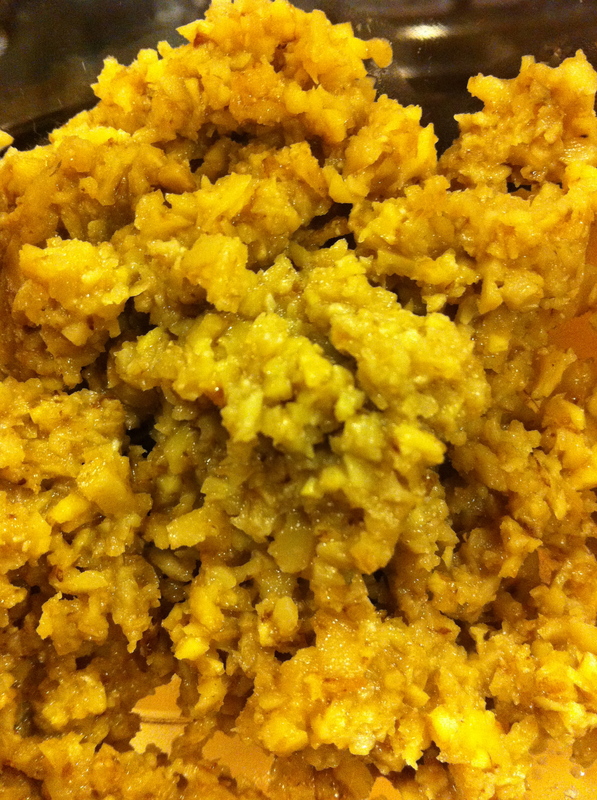 The artichoke puree does need more volume to engage properly in a blender. In general you need enough volume to cover the blades – you can get by with a little less that that. Also, as a general rule, immersion blenders (aka stick blenders) can puree a smaller amount than a regular blender if you use them in a narrow container. There are rotor-stator homogenizers that work with very small volumes (they go inside test tubes) but they don’t have much cooking use unless you puree truffles a lot. I think that your problem with the beet texture is that your blender is not powerful enough. Vitamix or Thermomix would do much better. A rotor-stator homogenizer would do even better, but they make a Vitamix look cheap. Since you are dedicated to cooking your way through the book, you may want to start looking for an r-s homgenizer on eBay now. You can make almost everything with a good blender, but once you use the r-s you’ll be hooked. It is probably the most used equipment in our kitchen. There are some foods (chestnuts and chickpeas for example) that are almost always grainy. unless you use r-s homogenizer, or better yet a high pressure homogenizer. However, beets should be able to get pretty smooth with a decent blender. Dr. Myhrvold – I appreciate you taking the time to read my posts and commenting! Yes, I understand that wasn’t the intent but there they were, so I thought I’d get a head start. It’s been a lot of fun working with them. I really do love the format of the recipes – clear, concise and to the point. I knew that taking them out of context might lead to me missing some crucial information, so thank you for the advice. 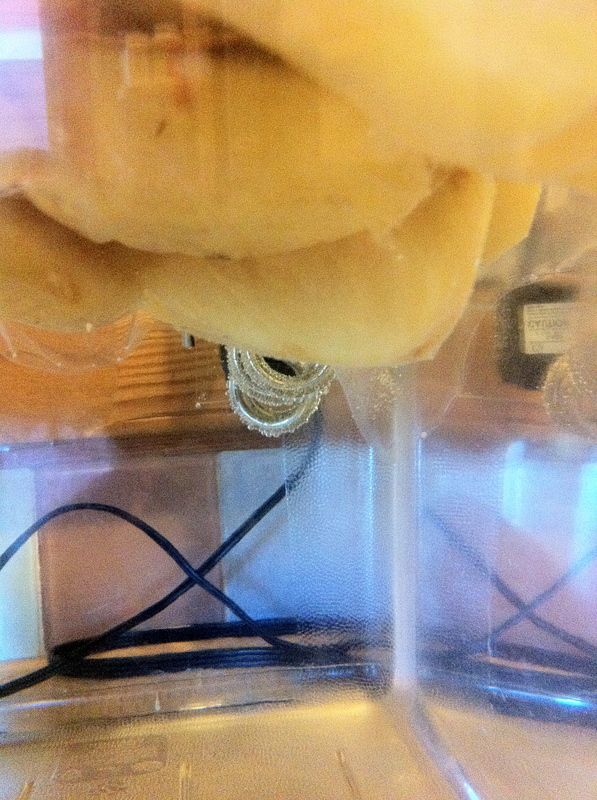 Over the last few months, I’ve managed to find a cheap vacuum sealer, immersion circulator, and even a centrifuge. Rotor stator homogenizers look amazing. Nothing on eBay right now, but I figure I have until mid-March, right? One of the ideas behind this blog is to show that contemporary cooking practices can be done at home by a non-professional. I hope my efforts inspire others to try them as well. I want to do your recipes justice, so I’ll revisit the artichokes and beets so that they are indeed smooth. I am looking forward to the finished work, and thanks again for your thoughts. 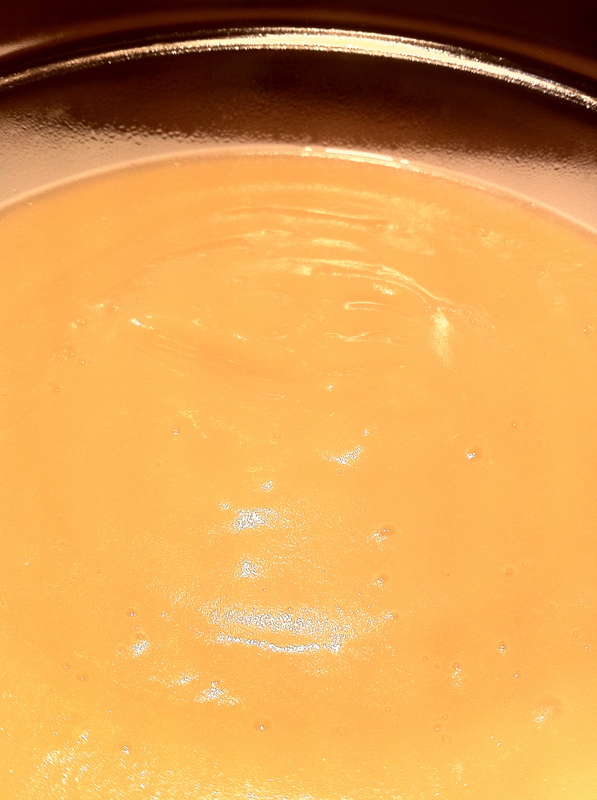 We re-tested all three of these puree recipes, and they came out great for us. We used a VitaMix blender, and I think that is the key reason. 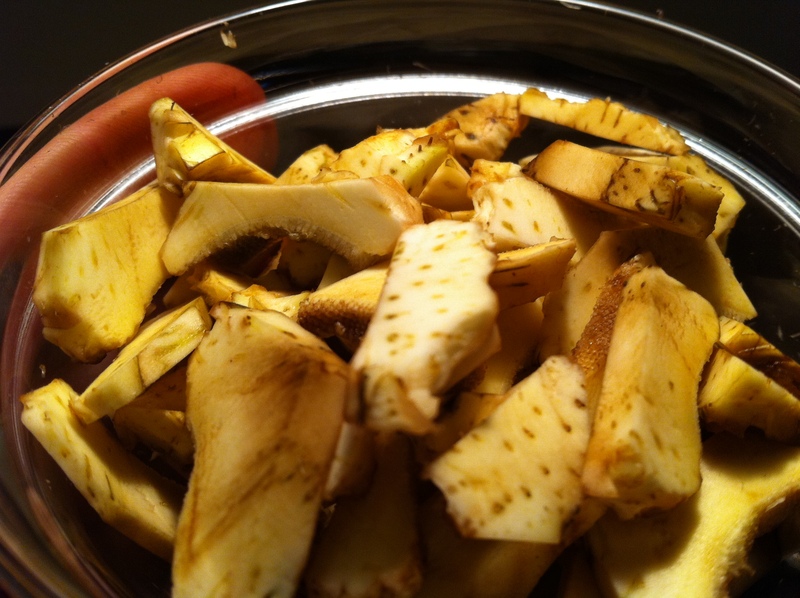 The taste that we are after is fresh – not raw, but not stewed-to-death. 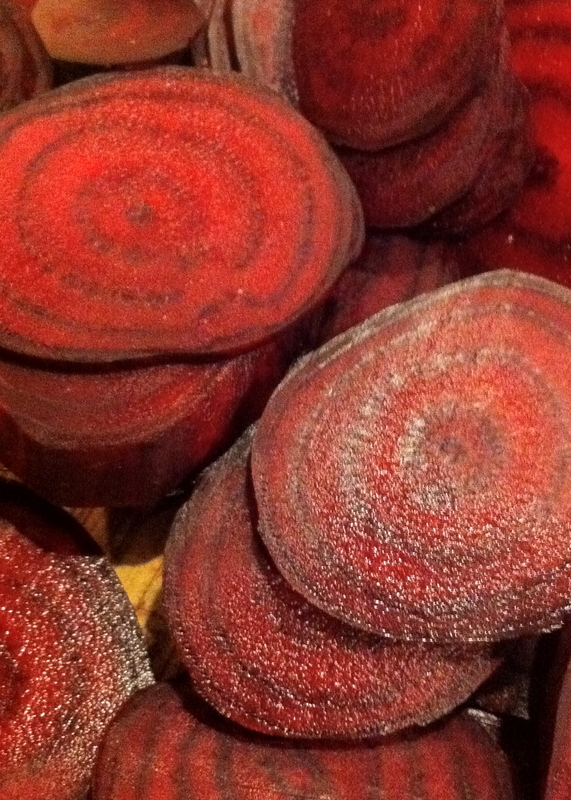 If you cook the beets longer, or at higher temperature, then you can make them softer and they would work better with a home blender, but then the taste isn’t quite as good. 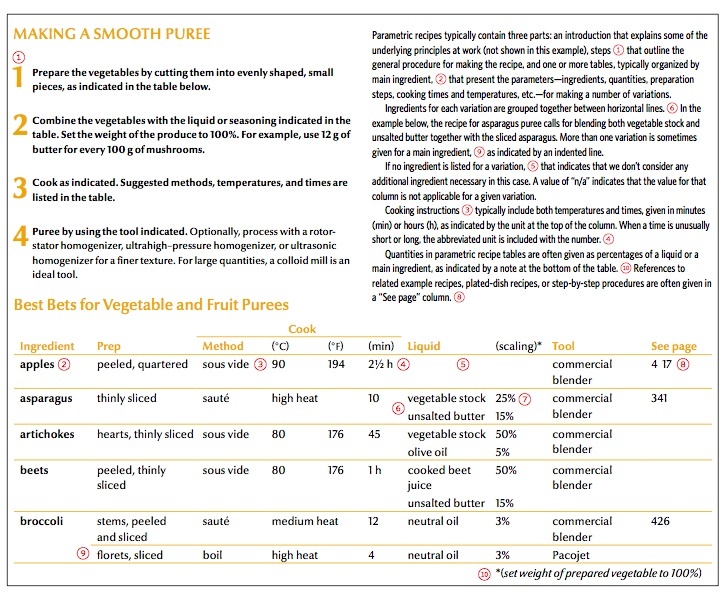 So our approach is to cook it less (to preserve the taste) then use a commercial style blender to mechanically puree. One other point is that straining through a chinois kitchen strainer, or a more high tech lab sieve, is important if you want totally lump free purees. Even a VitaMix will have a few particles that are not broken down to a small enough size. Thank you for more insight into the recipe. 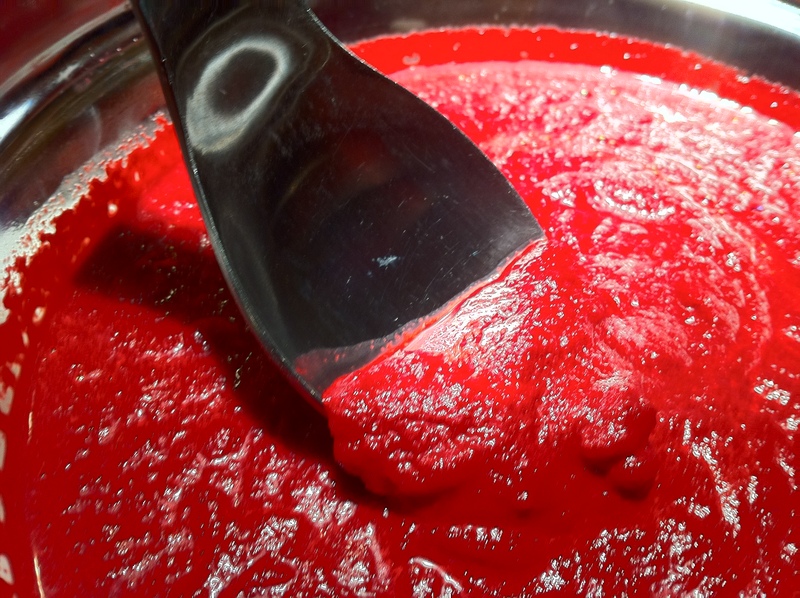 I received similar advice from Eric Rivera, one of my cohorts in Jet City Gastrophysics: “Cook your beets longer, send them through a sieve, don’t throw away the foam…..always send a puree through a sieve. 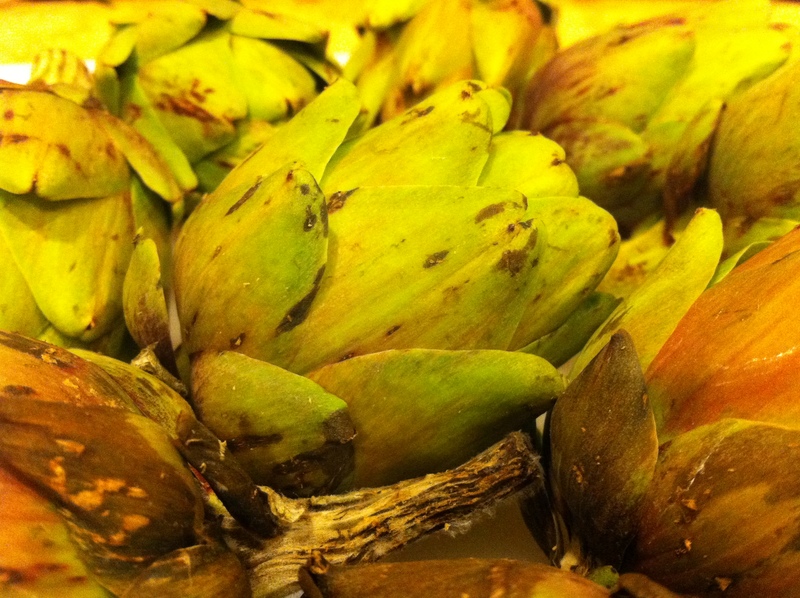 Artichokes are crap right now anyway, wait until they’re in season.” Advice well taken! I have researched homogenizers, and now have a general idea of brands and price. It seems the handheld ones are less expensive, but are not as fast, so are not able to make a fine a mix as the tabletop variety. Dave Arnold at Cooking Issues used a handheld homogenizer when he created the oyster food for his successful experiment in live infusion of oysters, so perhaps that is sufficient enough. Of course, I have a Cuisinart blender now, so maybe a VitaMix next, then a homogenizer. Or maybe more storage to keep all these new contraptions. Thanks again. I’m planning to start on the new purees this weekend so I better get access to a better blender!